Came across a good sketch, a good color combo and pattern challenge that I took all and turn it into one layout instead of three different one. Here is one layout that I did using Creative Scrapper Sketch #165, color combo challenge #202 and a pattern to be in the layout – wood grain. I’m also trying to use misting, stamping and embossing in my layout, no chipboard though. ‘Cos I’m thinking of the August challenge over at Scrap-it-lah. Still, I’m happy that at least this time I’ve used my masking template from Prima that I bought recently and today is it first time being used. I’m also loving the glittering embossing powder that I have on those pigment ink, what more I get to use my favorite stamps from Technique Tuesday Ali Edward design. Yup, have been using them for the recent layouts. Are you joining any challenge lately. If not, why not join Scrap-it-lah August challenge, use Creative Scrapper’s sketches and the Color Combo with wood grain pattern. I’m so thrill to receive a package filled with Fancy Pants’ Delight papers the other day. It is from Helen of Scrap-a-little. She has got flower tutorials, sketches and techniques to share in her blog. Her sketches are all here in her sketch blog. I’ve been wanting to scrap these photos awhile back, but just didn’t find the right sketch or the right mood to do it. It is in fact just two different pictures, one is the copy of the other one if you look closely. I’ve used a lot of Technique Tuesday Ali Edward’s stamps on this layout with different ink. The letter sticker is while on white doily, but since it has dimension, you won’t have problem reading it. That butterfly is from Martha Stewart’s punch, misted and layered together. Helen has got so many great sketches for you to try out, why now pick one or pick some today and start creating. She’ll be happy if you can quote her site once you’ve used her sketch. Here is how all those pages look like, I’ve fan them out and I’ve only used one of the paper to make the layout above, plus my own craft and cream card-stock. Haven’t been much of scrapbook layout recently. Felt like loosing touch with a good friend. So when I found this sketch over at Sketchy Thursday and later on found some old photos that I haven’t scrapped, I straight away get down to create. Been really missing those creativity work. There are over 70 people using the sketch at the moment. Sketchy Thursday like its name says, they always have new sketch on Thursday and you’ve got one week time to play with it and have it link to their Mister Linky. If you are chosen, you can even win yourself some scrapbook stuff! So, have fun! I’ve also used Technique Tuesday Ali Edward’s stamp. I love those sentiments that Ali created and pretty much love to use it in my layout as a reminder of the meaning in life that I should be looking for. So, what have you created this week? Hello people, how are you all doing? 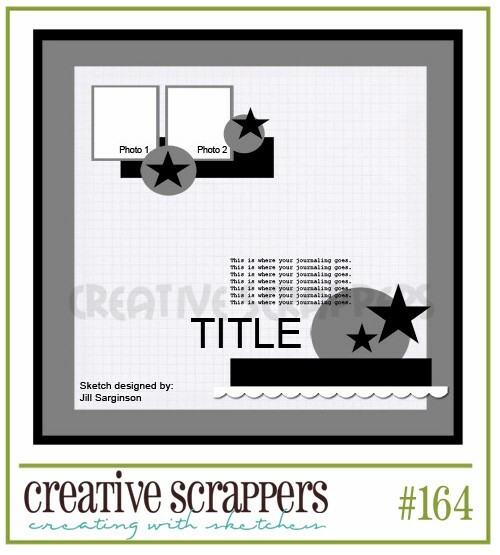 Have you joined in the fun challenge over at Scrap-it-lah? Have you also been trying out other challenges in the net? Where do you normally go? And do you find it challenging at all? Or do you find it helpful for you to try out new techniques or do your layout faster with challenges? I know I’ve used the colors part and the journal spot which is there on top of my doily. But not so sure if I’ve done the summer topic part. What do you think? Here are some close-up of the layout, which I tried on embossing and stamping. I love Ali Edwards stamp in Technique Tuesday. Love those sentiments that reminded me on how I should be grateful on small little things, that I should appreciate my day to day life. I’ve also used my Making Memories Slice to create that swirl and layered them into a thick and sturdy swirl that I can mist and embossed. This layout is so not the usual kind of my-style. It is an experiment in using new technique. Even that sort of paper background is not my kind of pattern that I would normally go for. So what do you think? Would you also be inspired to join Sketchy Thursday challenges? Don’t forget to head on over to SIL for the July challenge. How are you all doing on this festive day? Today is actually Duan Wu Jie for the Chinese all around the world. Hope you have had your share of the dumpling today. Scrapbook wise, I’ve done a layout for the sketch challenge over at Scrapbook Daisies – blog challenge #5. I love the pop-up die-cut and chipboard stickers. They are just so cute! This layout came together pretty easily with the sketch. The longest part is to type out the journal and cut them into strips then adhere them into the layout after I’ve ink them a bit with distressed ink. I’m actually using Scrapbook Daisies month kit for this layout. Do check them out and Martha always prepare wonderful kits. I’m using March Happy Go Lucky kit and February True Blue mini kit. Hope to see you join in the fun in Scrapbook Daisies and do look out for more challenges for this month. Okay, I gotta go, dinner in mom’s place, yippie!